One month later and things are starting to come together. Hopefully. Studio Bordet (or whatever it will be called) is on the road to construction – it has power, light and walls. The next step is building a frame to hold PC, keyboard, mixing desk and various other bits of musical gear. With the addition of plasterboard, sound insulation and flooring there is just under 2m2 of useful floorspace, which is even less than I had hoped for, but should still provide enough space to have a usable setup and be able to play bass or guitar in the room. Playing the theremin in there will definitely not work, though, due to lack of space, so I’ll still need to cart it around the house depending on whether I’m practicing or recording. 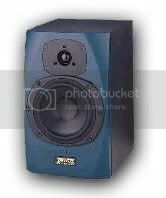 I did a recording recently for the local band using my new multi-input interface which worked out really well (apart from running out of disk space), but having listened to the mix I initially put together it has become painfully clear that I need a decent set of monitoring speakers. I have a good set of headphones, but mixing on ‘phones is never a good idea, so I try to get a reasonable sound using them, then switch to my PC speakers, which are pretty good quality for a PC, but still far from HiFi. The mix I ended up with sounded pretty good on the PC, great on the ‘phones, but unfortunately lousy in the car or through the little box we have in the kitchen. I knew the day would come when I’d have to fork out for decent speakers – it’s one of the things you really can’t skimp on (like microphones) to get a good sound, but it’s not as exciting as the wonderful wealth of fancy studio toys available. So… Some research, testing and budget-balancing later, I’ve finally bought a new set of speakers, and the winners are… Tannoy Reveals. I got a pair at a good price from good old eBay, and they’re sitting in their box waiting to become centrepieces of the new studio, such as it is. Apart from the great balance between sound quality, tonal range and price, they have a couple of other ‘feelgood’ bonuses. The Tannoy factory is about an hour’s drive from here, so supporting local business is good. I went on a fantastic guided tour there back in my early days of getting interested in sound engineering and have two lasting memories. Firstly, getting to spend a few minutes in their anechoic chamber – a really weird feeling having NO echoes at all, and particularly disorientating when they shut off the lights (to complete darkness) and you realise how much of your balance is dictated by audio and visual cues. Secondly was getting a demo of their top-of-the-range speaker systems at full tilt – revealing a level of detail in the music that I simply hadn’t heard through normal speakers. Plus, what’s good enough for Mr Keneally is good enough for me! In other news – I have finished my theremin/ebow remix and look forward to hearing the final album – details to follow soon, I hope. I ended up submitting two versions – one with vocals and another without – on subsequent listenings the vocal-free version is more pleasing to the ear! Bordet the Builder (Can he mix it?) Lunar Sea Hat Change Hands Off! Bookmark this article Studio Progress…?